Daily Deals by Email Only! The magical or lucky powers of the Shamrock, or four-leaf clover, are legendary. Eve is said to have taken the plant with her as she left the Garden of Eden, so it symbolises a piece of Paradise. St Patrick allegedly used it to explain the Holy Trinity, whilst a four-leaf clover is said to symbolise the Cross and the Grace of God. Then again, the Celts believed the leaves stood for Faith, Hope, Love and Luck, whilst children in the Middle Ages believed a four-leaf clover allowed them to see fairies. That’s an awe-ful lot of luck! However, your chances of finding the real thing are 10,000 to 1! 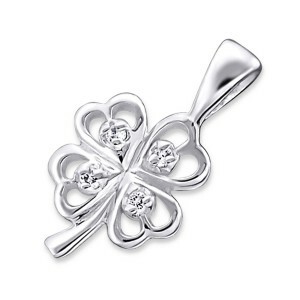 So why not shorten the odds and grab yourself some Sterling Silver luck via this exquisite pendant with its four shimmering CZ? Size: 9 x 12mm.